To celebrate the opening of 2019, GrossDanceCompany hosts an exciting evening of contemporary dance, together with five makers. GDC's artistic leaders Jeroen Fransen & Sagí Gross have invited and programmed Maurice Causey, Corneliu Ganea and Fernando Troya to present original creations together in one evening. Next to the performances, the evening will include as well short dance films. 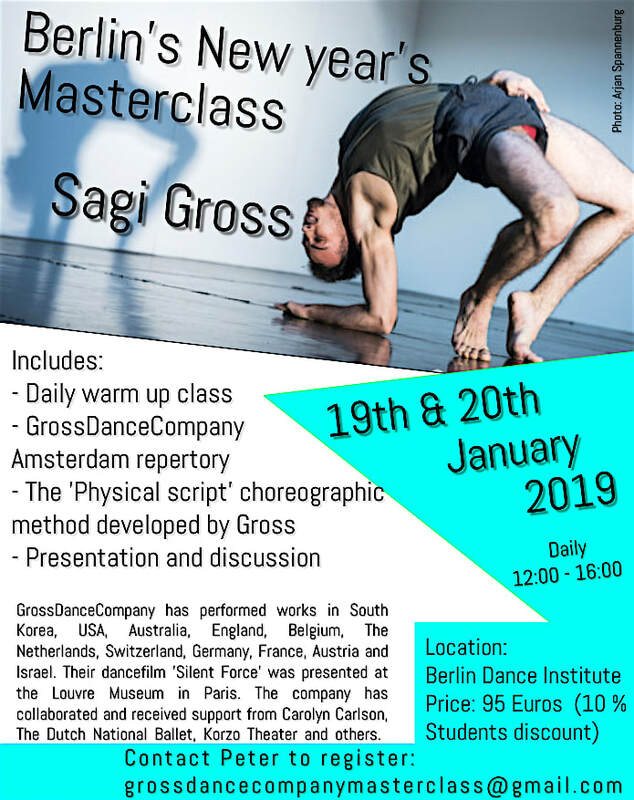 Join director and choreographer Sagi Gross for a two days masterclass in Berlin Dance institute. 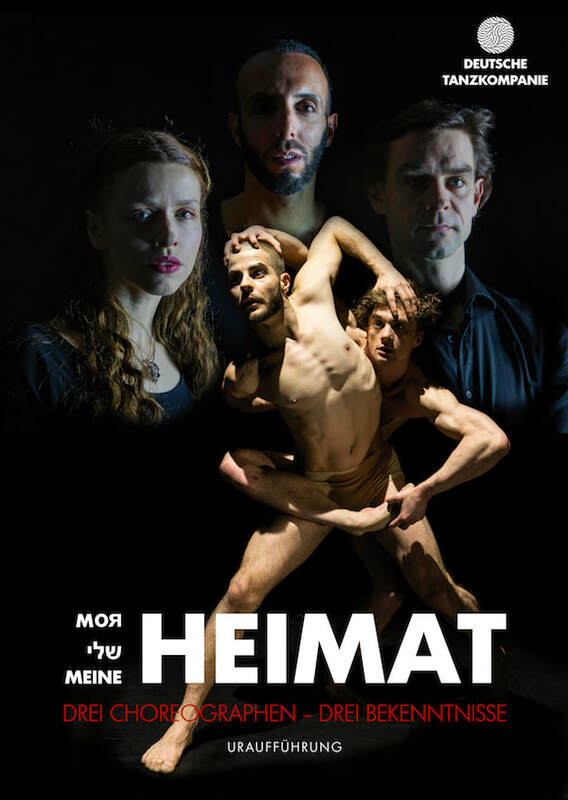 The project is supported by Goethe institute and by the Dutch and the Israeli embassies, therefor it is offered for professional dancers as an opportunity to join these unique 5 days 'laboratory' workshop free of charge. Physical script - GrossDanceCompany choreographic LAB week in Istanbul from Gross Dance Company on Vimeo. Jeroen Fransen and Sagi Gross. GrossDanceCompany will take you through their poetic and slightly absurd exploration of the famous painting Nighthawks by Edward Hopper from 1942. What kind of people sit at the bar? Where do they come from, where do they go and which emotions flow and swirl under their nightly facade? 'DayTime Moon' (Fragment) will be presented at Openluchttheater - Open Air Festival in VondelPark Amsterdam. ​August 17th at 8:30pm. ''Loneliness does not have to be negative, we can also learn from it'', Thomas Dumm (Online magazine 21-08-2017). "Sometimes when I see the moon in the daytime, I feel as though it doesn't belong there, and that I, just like the moon, am in a place where I don’t fully belong. As an integrated immigrant, the movement between the two worlds stays, but fascinates me.'' Sagi Gross. In this performance, the choreographer works with extremes. Based on his “Physical Script” method of dance, he uses his dance idiom to share these emotions with the audience. Gross puts his dancers in pointe shoes, so we may see how they stand up miraculously, twisting and turning literally and mentally to connect. The dancers in DayTime Moon follow their inner voice, seeking freedom and trust. The creation was originally made for GrossDanceCompany in 2008 and presented in The Netherlands, France and South Korea. The development of the creation was co-produced by CCN Carolyn Carlson Roubaix France. It was also commissioned by companies Grand Rapids Michigan Ballet and Pori Dance Company in Finalnd. One Charming Night will be presented for the first time in Germany on *April 28th, May 4th & May 26th 2018. The world premiere of 'DayTime Moon' will be presented in Theater Bellevue in Amsterdam on October 10th & 11th at 8:30pm. October 5th Tryout at Schouwburg Het Park, Hoorn at 8:30pm. ​GrossDanceCompany will perform at UITmarkt festival in Scheepvaartmuseum Amsterdam, to celebrate the opening of the theaters season. The performance will be on August 27th at 18:00. DayTime Moon by GrossDanceCompany from Gross Dance Company on Vimeo. Full version: August 3d, 20:30 in Compagnietheater Amsterdam. Created by: Jeroen Fransen, Sagi Gross & Nish Gera. Hosted by Nicolas Mansfield, Director of The Dutch National Touring Opera Company - Nederlandse Reisopera. 'ON THE MOVE' aims to unite these elements of human movement, migration and dance. LGBT people who are inevitably part of the wave of refugees arriving in Europe remain highly vulnerable even when they have escaped the immediate threat to their lives and arrived in the west. They are “doubly marginalized”, as forced migrants and sexual minorities. Often they face the threat of abuse and discrimination within their own communities, being “The Other” even amongst their own people. ​Gross Dance Company hosts an evening with five makers, for a special celebration performance to end the theatre season and open the summer. 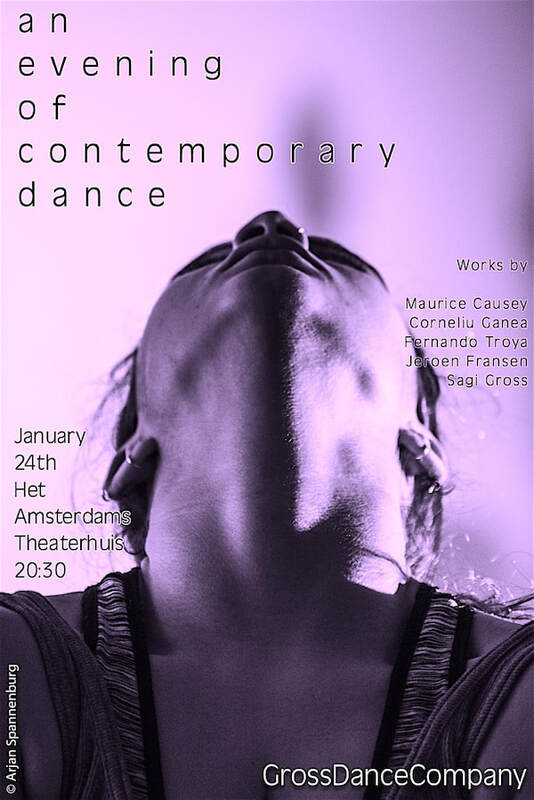 GDC's Artistic directors Sagi Gross & Jeroen Fransen have invited Maurice Causey, Peter Leung and Fernando Troya to present their creations together in one evening. Let's Get Physical' is a production of GrossDanceCompany. For 'WHAT DO WE KNOW' the new dance theatre performance of Gross Dance Company, the creative duo Sagi Gross and Jeroen Fransen embrace the personal stories of LGBT Syrian refugees as a starting point and weave it together with Kafka's The Trial. Dancers: Steffi van Bokhoven, Lea Giamattei, Kahlia de Matos, Jeffrey Stuut, Faizah Grootens, Rob Polmann. Supported by: Amsterdams Fonds voor de Kunst, Prins Bernhard Cultuurfonds, Ostade Amsterdam. What do we know by GrossDanceCompany created by Jeroen Fransen & Sagi Gross from Gross Dance Company on Vimeo. On October 28th & 29th at The Phoenix Theatre in Wollongong Australia, Austinmer Dance Theatre, will premiere the new choreography 'Corners', which was created by Choreographer Sagi Gross especially for the Australian company. 1st & 8th of October, both dates at 8pm, Gross Dance Company will present an intimate dance performance at Belcampo, De Halle in Amsterdam. The performance will include two short dance films and a live dance performance. ‘Agnieszka’ (2008) and ‘Silent Force’ (2015) by director and choreographer Sagi Gross are dancefilms which were presented Internationally. In 2015, ‘Silent Force’ was programmed and screened at The Louvre museum in Paris, during the 8th French art films festival and during Cinedans in EYE museum in Amsterdam. The films are featuring Shirley Esseboom (Former Nederlands Dans Theater), Sagi Gross, Christian Guerematchi, Lauri Kee Schep and Agnieszka Dlugoszewska of Swedish Cullberg Ballet. The dance performance will include fragments of Gross Dance Company's recent production 'Blind Sight'. This performance is a collaboration between Gross Dance Company, KunstenIsrael and Belcampo - De Halles / Gary Feindgold. Gross Dance Company, will open the new season at the UITmarkt festival in Amsterdam. The performance will take place in Theater Bellevue on 27th August 2016 at 6:30 pm. The entrance is FREE. Gross Dance Company's 'Blind Sight' will open the OpenAirTheater Openluchttheater festival in Vondel park Amsterdam. The program will be shared with Nederlands Dans Theater (NDT). NDT1 will perform a creation by Marco Goecke, 'Woke up blind' at 8:30pm - 8:45. GDC will perform Blind Sight at 9:00pm - 10:00pm. Blind Sight GrossDanceCompany by Sagi Gross & Jeroen Fransen from Gross Dance Company on Vimeo. Blind Sight will return to Theater Bellevue in Amsterdam on Tuesday May 17th and in Genova Italy on May 24th as part of The International Festival "Genova OutsideR DanceR" in Casa Paganini Genova Italy. The performance in Italy, will be part of a science&dance research collaboration between sound and computer engineer professor Antonio Camurri of The University in Genova, Choreographer Sagi Gross and Director Jeroen Fransen. The research is a second phase which started in March 2016 together with professor Beatrice de Gelder - University Faculty of Psychology and Neuroscience in Maastricht, during the symposium 'When arts meets science' at Theater aan het Vrijthof. The events in Italy are supported by Goethe institute, Teatro Carlo Felice, Casa Paganini -Infomus and GrossDanceCompany. The creation of Blind Sight is supported by Amsterdam Fund for the Arts, Zwolle Theaters group, The Dutch National Ballet, StudioDOK. Susan Pond - Dance Europe Magazine London. December 2015. ​Blind Sight is a metaphor for the impact of social and technological developments with human connections. The ability of humans to process certain vital and sometimes destructive information has fascinated creative duo ​Sagi Gross (choreographer) and Jeroen Fransen (multidisciplinary artist) for a long time. How does a society, a group or an individual deal with the overwhelming amount of information, images, tensions and conflicts in the world around them? How do we process these events, which are sometimes shocking, as a part of our experience? How does this mechanism in our physical being unfold unconsciously rather than rationally? What is the role of our senses in these complex processes? Since our brain uses multiple parallel roads, which are concealed within the confines of the body, Gross, Fransen and the dancers push their limits in this performance to find and reveal these boundaries. A group of dancers is standing in a brightly illuminated space. Their eyes seem to scan constantly the area below. Their accidental physical confrontations do not lead to a real encounter-they collide and bounce off. They need another way to get to see each other. Their reactive movements seem to be an effort to use other senses to see and meet that person. August 30th during the UITmarkt, TheaterBellevue Amsterdam. August 21st at OpenAirTheater in Amsterdam. 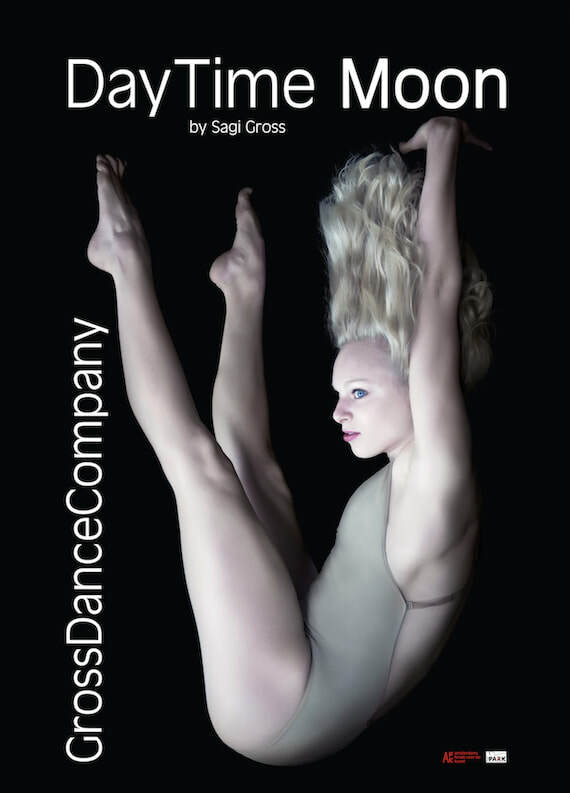 Meet MOVEMEDIA choreographer Sagi Gross from Grand Rapids Ballet on Vimeo. 'Silent Force', Gross Dance Company's world premiere will be presented in Korzo Theater in The Hague on 26th & 27th of March 2014. 'Silent Force' is a double bill which includes two new world premieres by Choreographer Sagi Gross. 'My song' is a solo created specially for Shirley Esseboom. In this choreography Gross explores the artistic sensitivity and subdued powerfull presence of this dancer. Gross focuses on Esseboom's driven source and inevitable development as a mature dance artist. The constant physical growth of a dancer's body and what does it mean to become a mother? The physical poetry of 'My Song' shows emotions and memories as hidden in body and soul. Esseboom translates Gross's original innovative physical language to the stage. Shirley esseboom was honoured with a Golden Swan for her impressive dance career in 2009. For fifteen years she was a leading dancer in NDT, where she interpreted choreographies of Jiri Kylian , Hans van Manen, Lightfoot/Leon and others. Silent Force - Interviews with Choreographer Sagi Gross & Dancer Shirley Esseboom from Gross Dance Company on Vimeo. 'One Charming Night' created by Sagi Gross will premiere in Finland at Pori Dance Company on April 13th& 14th. The creation was commissioned by the Finnish Company. It is planned to tour Nationally and internationally. One Charming Night work-in-progress from PDC PoriDanceCompany on Vimeo. Preview of the coming production of Gross Dance Company 'Silent Force' will be presented on Friday 16th at 21:00 & Friday 23d at 20:30 - August, during the Openluchttheater Festival 2013 (Open Air Theater Festival in Vondel Park). 'Silent Force', a double bill, will premiere in Korzo Theater The Hague in March 2014 and will be performed in Amsterdams Theater Bellevue in April 2014. The performance is FREE and open for public. Supported by Amsterdam Fonds de voor kunst, prins bernhard cultuurfonds, Korzo Theater in The Hague, Studio Anna Mora Amsterdam. 'Pedestrian Fields' will premiere in Mousonturm, Frankfurt on May 24th followed by performances on 25th & 26 of May. Further performances at Tanzmarathon of Zukt, 4th, 5th and 6 of July 2013. On May 9th 2013, Gross Dance Company will take part at The Spring Festival in Israel. This will be the first tour of the company in Israel, which will include a performance and masterclasses of the company's rep.
Miguel Oliveira (former soloist of Nederlands Dans Theater), will dance the creation 'Skin' by Choreographer Sagi Gross. The solo premiered and receive support from Korzo Theater in The Hague in May of 2011. 'Skin' has been presented on stages and festivals in Denmark, Germany, The Netherlands and France. GrossDanceCompany, co-produced by the legendary choreographer and director Carolyn Carlson - Artistic Director of Centre Chorégraphique National Roubaix Nord-Pas de Calais as part of the 'Red Bricks Project'. French premiere of 'One Charming Night' + 'Skin' + 'Moon' + 'Side' at Carolyn Carlson CCN Roubaix will be on the 16th of October 2012. Dutch premiere in Amsterdam's Bellevue Theater in May 21st 2012 at 8:30 PM. Co-produced by Carolyn Carlson - Artistic Director of Centre Chorégraphique National Roubaix Nord-Pas de Calais, France. The new creation by Sagi Gross 'Side', which is a solo, will premiere and performed on the 28th & 29th of June 2012 in Tanzhaus NRW in Dusseldorf, Germany. Sagi Gross is invited to choreograph for dancers of The English National Ballet in the first LAB project at DanceEast Jerwood in Ipswich, Artistic Director Jonathan Lunn, Executive Director: Assis Carreiro, Artistic Advisers: William Forsythe, Wayne McGregor, Kathryn Bennetts, Michael Trent. The multidisciplinary performance ‘Naar Nederland’ collaboration with multidisciplinary visual and performance artist Jeroen Fransen (toured 4Xperformances in Holland during 2009-2010), will continue a research period in WP Zimmer in Antwerp, Belgium. Artistic director and advice - Carine Meulders. 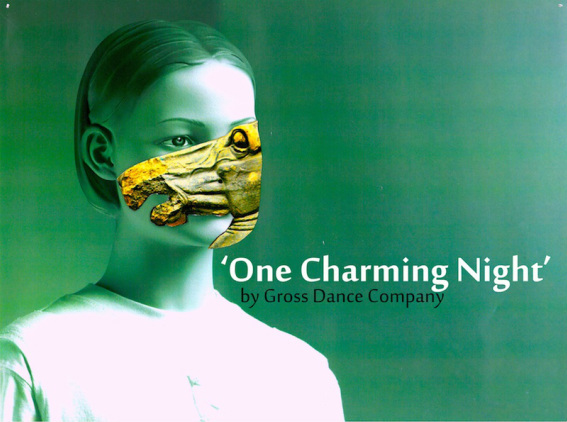 In June 2011 during The Busan International Dance Festival and The Pocket Dance festival in Seoul, Sagi Gross will present a new version of the piece ‘One Charming Night’ for 4 dancers. Sagi is as well invited to teach a workshop in Busan Dance Academy. Sagi Gross will present the solo ‘Skin’ in The new Korzo Theater in The Hague, during the program Voorjaarsontwaken 2011.